The Churchgate Sausage Company make some really good sausages and when we were in there last we found some interesting Chicken Kievs...well in for a penny! We've been predominantly sampling pork sausages so these chicken ones are a bit of a departure but we must see what there is out there that are "other than pork". 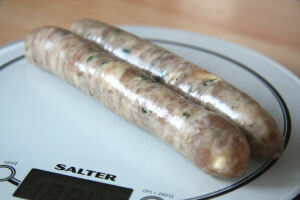 From the look of the raw sausages we noticed yellow'ish blobs under the skins in the mix. Jason Drage owner of the Churchgate Sausage Company explained that in development they had tried different ways of delivering the garlic flavour into the sausage and the best way they had found was to put small daubs of garlic butter in to the mix with some parsley. 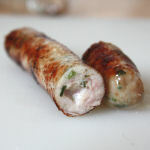 The 100% chicken thigh used is very lean so the butter also provides the necessary fat to keep the sausages succulent. When raw there was a delightful garlic aroma, which although obvious wasn't too strong, but when cooking, wow, the aroma was superb! Now these sausages cook up really well and we're not just saying this glibly, they really do taste wonderful. A close texture with the really high percentage of meat and a superb bite, almost a snap. I stabbed one from the pan and bit in to it. Ooh! Really good, but care is required if you do this as you could bite in to a hot pocket of garlic butter which may result in blistered lips! Go on, it's worth the risk! 150x25mm before cooking, 145x23mm after. 63g before cooking, 56g after. That's a shrinkage of 11% & weight loss of approx 10%.